I get inspired by the weirdest things. Sometimes its a name, a flower, colour, or someone else's project. 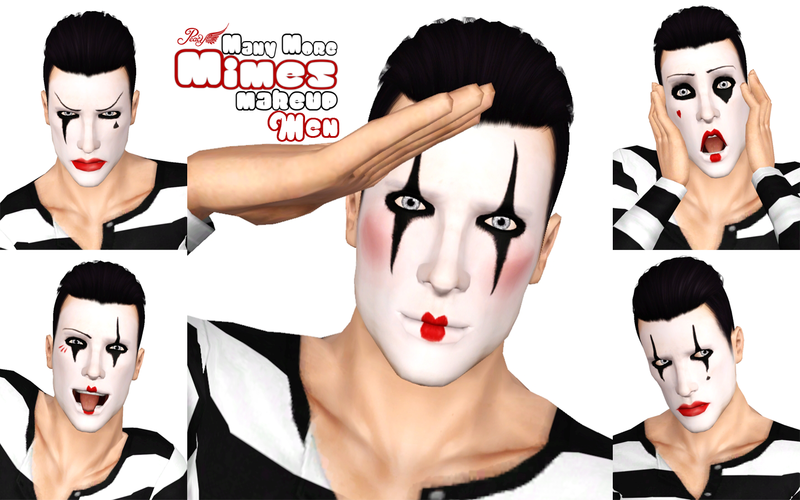 This time, you guessed it, was mimes. A friend of mine is currently entered into a competition at Simatography for the biannual SIFF Battle of the Bands and has decided to enter a band of mimes. You may be asking me "why is that inspiring?" Well, its more about the lack of content for mimes. Mimes are a very diverse bunch, but EA only saw fit to give us one female and one male mask. Google mimes and you will see there is a never-ending number of ways a mime can paint their face. So I decided to make her some, and due to popular demand, I have cleaned them up so everyone can enjoy the unique weirdness of mimes. So, the makeup is available in 5 styles for both male and female (the are as neat as possible, but the morphing of the face does distort the shapes of the makeup, something I have no control over and is most evident in the 4th variation). The makeup is also basegame, so you do not need Showtime to have your very own weird mimes. There are 4 recolourable channels, the face powder, eyeliner/eyebrows, lipstick and the individual detail on each of the masks. The archive contains both the sim3pack and package files, so choose one file type and delete the other. As always read my TOU on my blog or my tumblr. Ooooh! That looks Really cool! Unfortunately no. I The makeup works differently in TS4, along with the texture size and shape. It would need to be remade from scratch. I don't know the ins-and-outs of makeup creation for TS4, and its not a priority for me at the moment so there is no plans on making this for TS4. Sorry.